IHG (InterContinental Hotels Group) continues to increase its presence in the Philippines with the opening of Holiday Inn & Suites Makati today. 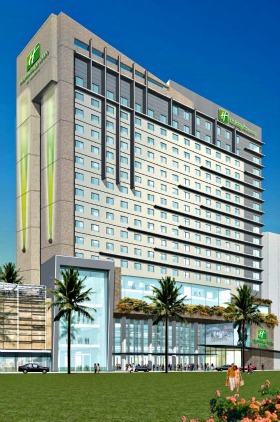 The hotel is the fifth IHG hotel in the country and the third Holiday Inn hotel. The 348-room hotel is situated in the heart of Makati Central Business District, with direct access to local shopping and recreational areas. Holiday Inn & Suites Makati offers a variety of rooms to suit every guest, including 48sqm Junior Suites and 63sqm Executive Suites, as well as the 93sqm Makati Suite. All rooms feature thoughtful touches, such as child-friendly options inside the mini bar and activity kits for children. Executive Suites are perfect for families with a separate bunk bed area for two children, as well as a king bed for parents. It has a spacious living room with two LED TVs and a kitchenette with induction cooker and sink. The hotel’s Makati Suite boasts two bedrooms, a living room and a kitchenette. Guests will be able to tailor their stay with a choice of 'firm' or 'soft' pillows and a good night’s rest is assured with duck-down duvets and crisp white linen. The hotel promises a relaxing shower experience with adjustable power showers and a variety of bath products. Guests stay connected with free high speed and wireless Internet access and all 348 rooms feature a 40” LED TV. During their stay, guests can choose from a variety of dining options at the hotel. Flavours offers an unconventional take on dining with dishes from all over the world presented by flavour, rather than by course or ingredient. The restaurant’s child-friendly menu encourages children to try different cuisines with a youngster’s palate in mind. Citron Lobby Bar is the perfect place to unwind and re-energise with a great menu and friendly vibe. Oz Bar, which offers a skyline view of the city on the hotel's roof deck, is a unique destination in itself. Holiday Inn & Suites Makati joins its sister hotels in the Philippines, Holiday Inn Clark and Holiday Inn Manila Galleria, as well as InterContinental Manila and Crowne Plaza Manila Galleria.